Absolutely excellent rental experience. Great service, would rent again. Discreet, secure, professional, experienced and prompt staff. 24 hour Kiosk that makes it super easy to get yourself a storage unit. Its nice that they have a fence surrounding the units and you need a code to get in also. Very easy to sign up by internet and just drive to site immediately. 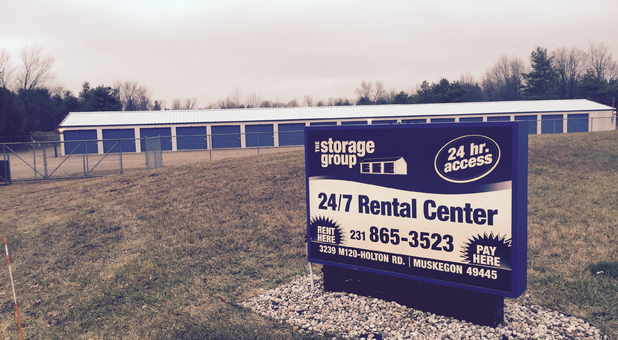 Clean storage units and 24 hour lighted and fenced in complex makes it even better. Everything went smoothly and was so easy will definitely rent from the storage group again for our storage needs. Very easy to obtain a unit online. Instructions were easy, great deal, and fast response back regarding my storage unit. The facility is newer and well kept. It is easy to navigate. Had a question, and received a response within 15 minutes. Would highly , recommend. The storage is very clean, easy to access, and I love how private and secured it is. The website registration was simple and easy. I'm extremely happy with the storage group. I would Highly recommend “The Storage Group” to anyone who needs a storage building. Very easy to sign-up for one online, very clean, and easy access as a renter to get in. Awesome and easy to order online! Great customer service, and awesome rates. Would recommend this company for your storage needs. Easy quick process. I had my gate code 15 min after starting the process. The office was a pleasure to work with. The units appear brand new. And fare pricing. Would recommend for anyone looking for storage. I would definitely recommend u guys! Like how easy it was to register with The Storage Group, the units were clean, and I'm so far satisfied! Well pleased with staff and facility! While I have helped people move belongings to and from a storage facility this is my first time as being a customer. The staff on the phone was friendly and I was quite impressed with the cleanliness of the units and grounds. Very personable, helpful. I love being able to rent unit, choose unit, ....everything online. Then you can move right in...just like that. You would think other storage places would have this option. But they don't, there are quit a few you have to drive to the place to do business. When I called they were very helpful. When I went to the unit it was very clean. Im very happy with this business. The entrance is secure and functions properly. The grounds and storage unit are clean and the door works smoothly. It all helps a difficult process go lots easier! Easy to use online reservation process. Lots of correspondence via email. Would recommend to others. Your various locations beat them all! What I like best about Storage Group is location! our unit is within three miles of our home and very handily accessible to us. Due to a very recent move, we are still constantly popping in and out of the storage unit to drop off or pick up needed items. We so appreciate your availability for us. You are our blessing. Very pleased with our experience. Great customer service, great rates, nice clean and easy to access facility. Love that you can set up online & the optional auto pay makes it a breeze with no worries. Love that they have several locations and different sizes units to suit your needs. Would definitely recommend The Storage Group! They are making our move so much easier. My wife and I just got a storage unit for our upcoming move. Very easy to rent, clean unit and easy payment setup. Simple to get started, very secure. Very convenient. No hidden fees and no hassles. Nice facility, simply needed a space for the winter months. The lady on the phone was very pleasant and helpful. Just returned from Ohio with a U-Haul trailer full of stuff. The shed was very clean. As soon As we reserved it she immediately sent out all the info to my email. Liked doing business with Storage Group. Location is great and unit is clean and still has a brand new feel! I'm pleased I chose them! I was very happy. It was a lot better after you purchased the Holton Road. location. Very easy to use and to deal with!! Thank you for everything! Very impressed with your organization. You guys were great. I had an issue the day I started my account. My problem was with the size of unit I rented. You were quick to remedy the issue. Just rented our 2nd unit there, love the convenience of the after hours kiosk . Very affordable, clean ,and convenient . Overall good experience. Will use you again if the need arises. Nice, friendly people! Cost was good. Response was excellent. Professional to deal with, thx! Love the cleanliness and 24hr access. First time ever renting and storage unit and I am very happy. Competitive pricing. Clean facility. Love the ease of renting with the automated kiosk. 24 hr access is great. Very convenient for when you decide you need a storage unit at any time of day. I plan on needing another unit soon and will definitely go back here. we did our research and decided on the storage group facility on Holton Rd. Registering was so easy and the facility is everything that we need for our storage needs. We feel secure knowing our belongings are here. Very simple process for getting a lock and getting set up with things. Had a small issue getting a gate code but with one phone call they quickly got me in. Units are elevated about 8 inches off the ground with a nice cement pad. We even noticed how even though it was blistering hot outside the units didn't seem to get super hot inside. Had a great experience from sign up to move in. I was a little leery at first, when I spoke with someone that wasn't actually an employee of the company. However, when I called to confirm the reservation and was told I could complete everything right at the kiosk at the storage unit, that was very helpful. The only glitch was our code that we were given initially did not work. We just made a phone call to the office and they were able to give us another one and it worked fine. Thank you for the years of renting to me!! No complaints!